Gold has been synonymous with wealth for millennia, but is it a good investment? 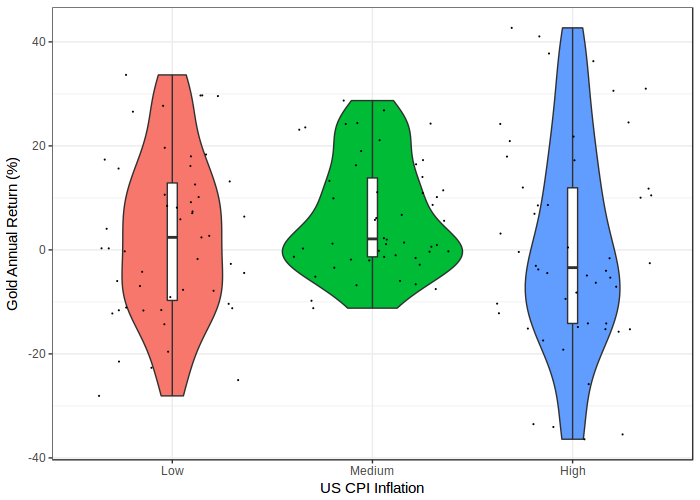 We find that contrary to received wisdom gold is a poor diversifier and offers little protection against inflation. The historical drivers of gold are pointing at a period of poor performance ahead. Gold generates no income and consequently has no fair price and so its price is driven by speculation. For these reasons gold is difficult to justify as part of a portfolio. What is the cost of holding gold? What is the fair price of gold? How does a strong dollar affect the price of gold? How do real yields affect the price of gold? Is gold a good inflation hedge? Is gold a good hedge for equity crashes? How is the price of gold affected by the strength of the pound? 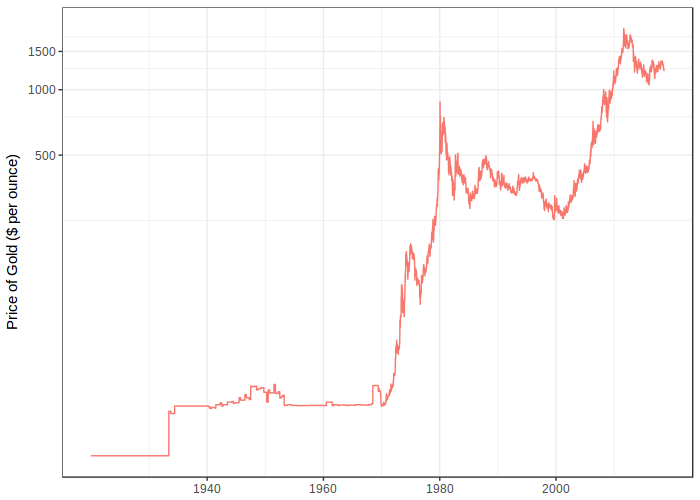 The price of gold since 1920 measured in dollars is shown below. Notice that over long periods of time in the past the price was flat. This is because the price of the US dollar was fixed relative to gold such that people could redeem a dollar for physical gold. The jumps up and down are politicians changing the fixed price. The gold standard ended in 1971, so we will only look at the price of gold after the gold standard ended and market forces started driving the price. Below we can see the value of $1 invested in 1972 in the S&P 500 with (red) and without (green) reinvested dividends and the value of gold (blue). This shows the power of reinvested income to boost long-term returns. Although the S&P 500 pulled ahead notice that it took 20 years from 1971 to 1992 for it to catch up with gold. 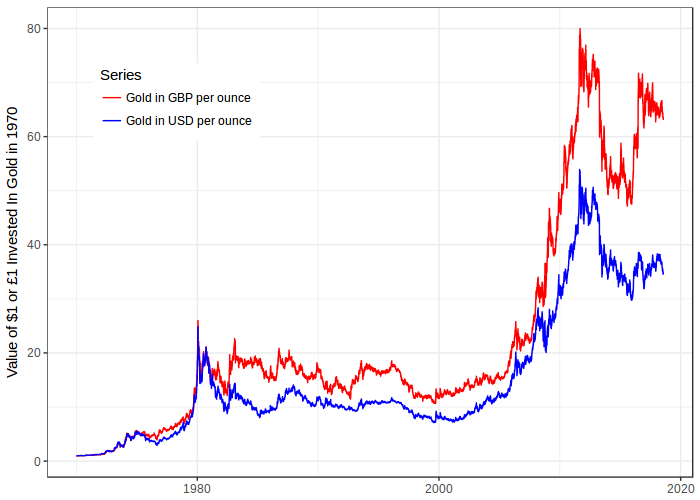 From 1971 to its peak in 1980 gold had a breathtaking 2200% rally, an annualised gain of about 62% per year. However this rally was followed by a thirty year lull and gold took until 2008 to match its 1980s peak. 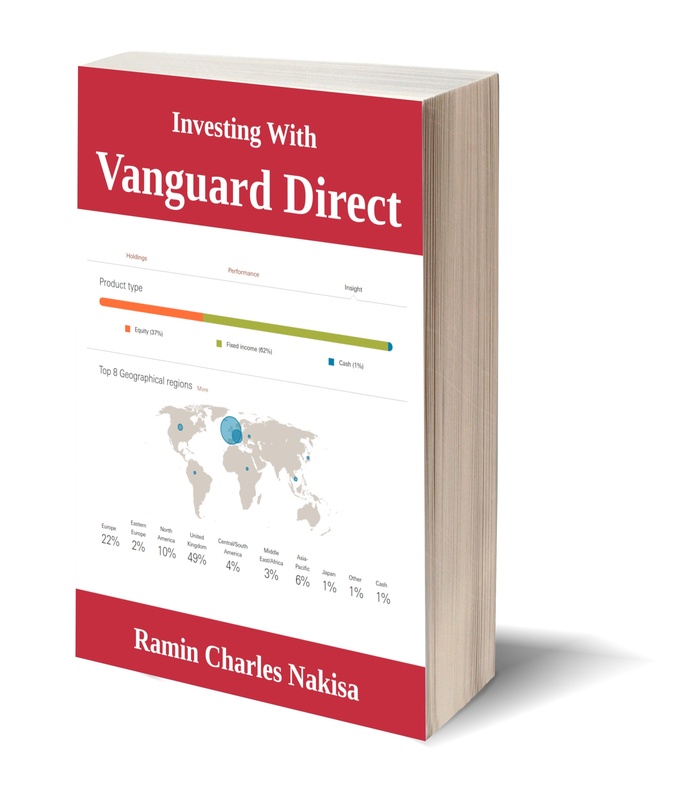 If you buy a stock you will probably receive a dividend and that will be paid for the lifetime of the company. If you buy a bond you will be paid interest until the bond matures. If you buy an equity or bond fund your share of the combined income of its assets will be paid to you while you own the fund. This is called positive carry: you are paid to hold these assets. Gold has negative carry. This is because gold has to be stored securely and this incurs a cost. The yellow metal is valued by thieves as it is untraceable once it is melted down which is why there are regular gold heists such as the Brink's-Mat robbery. Assets that generate a stream of income can be priced using a discounted cash flow model. The logic of these models is simple. If you can earn 3% over the next year by buying a US government bond which is risk-free then a dollar in a year's time is worth 3% less than a dollar today. That's because I could invest $0.97 today which would turn in to $1 in a year's time. A cash flow of $1 in two year's time would be worth $0.94 today. The further the cash flow occurs in the future the less it will be worth as it is more heavily discounted at the risk-free rate. If we know, or can make a pretty good guess, of what cash flows an asset will generate we can add up all these discounted cash flows to get a fair price. This valuation method is the bedrock of finance. It allows us to calculate the precise value of bonds and make a reasonable stab at the price of shares. Discounted cash flows give us no insight into the price of gold because gold generates no cash flows. Without this fundamental price anchor the price of gold is driven by unpredictable factors, as we will see in the next section. A combination of scarcity and high demand, primarily for jewellery which accounts for 50% of global demand, keeps the price of gold high. However the precise drivers of the price of gold are difficult to pin down and many people, including journalists who write about markets, hold false beliefs about these drivers. Commodities such as gold are quoted in US dollars so when the price of gold rises it can be seen as a strengthening of the value of gold or a weakening of the value of the US dollar. To gauge which is which we can compare the value of the dollar against a basket of its largest trading partners, an index called the trade weighted dollar index. This index should give a measure of dollar strength because it is weighed against multiple currencies. 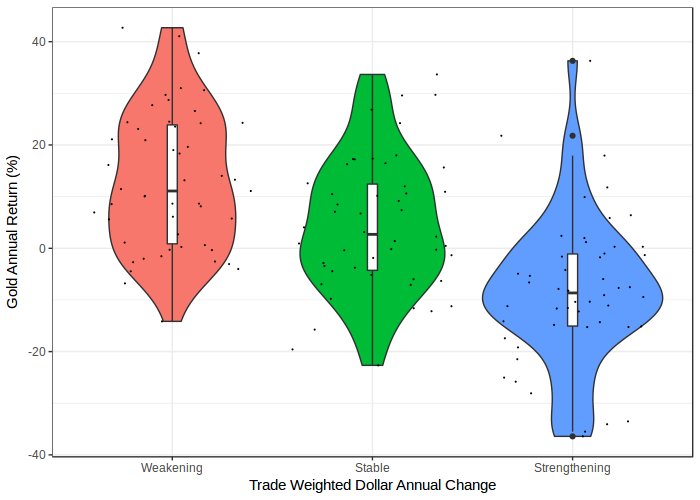 The graph shows dollar on gold annual returns using data from 1980 to 2018 and bucketing annual changes in the dollar into dollar weakening, stable and strengthening regimes (weakening -20% to -3% annual return, stable -3% to +3%, and strengthening +3% to +20%). As one might expect when the dollar is weakening gold returns tend to be positive and when the dollar is strengthening gold returns tend to be negative. I've used the 5% value arbitrarily but the point I am trying to make is that at some risk-free income point most investors will go for Treasuries. As rates rise gold becomes less attractive. However we have to be a bit more sophisticated with our definition of income because what matters is income adjusted for inflation. Investing for a 5% income isn't quite so attractive if inflation is running at 10% because in real terms this income would then be negative. As real yield increases we see a shift downward in the annual return of gold. 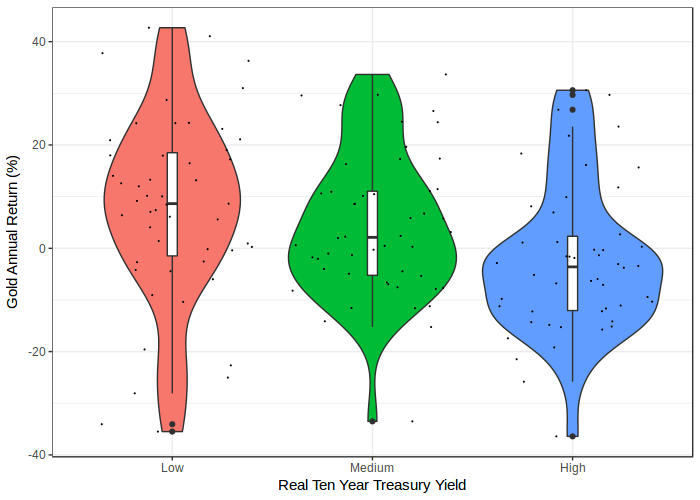 The categories for real ten-year US Treasury yield are -1% to +2% (low yield), 2% to 4% (medium yield) and 4% to 12% (high yield) and the data run from 1980 to 2018. A common misconception is that gold provides protection (a "hedge") against inflation. The reasoning behind this belief is that currencies today derive their value from faith in the government and its central bank to maintain the stability of their currency by controlling inflation. When this faith disappears we get hyperinflation such as during the Weimar Republic in Germany between 1922 and 1924 and Zimbabwe from 2008 to 2009. During periods of hyperinflation government-backed paper money becomes worthless but gold usually maintains its value for buying goods and services. While gold is useful during hyperinflation it is useless as an inflation hedge when inflation is behaving normally, which is almost always the case in developed economies today. Breaking inflation into three regimes from 1980 to 2018: low (-2% deflation to 2.3% inflation), medium (2.3% to 3.3%) and high (3.3% to 11%) the typical annual return of gold does not rise as inflation rises. As inflation becomes very high the return of gold becomes more variable and more volatile but is not consistently more positive. In fact, during periods of high inflation the annual return for gold was negative most of the time. 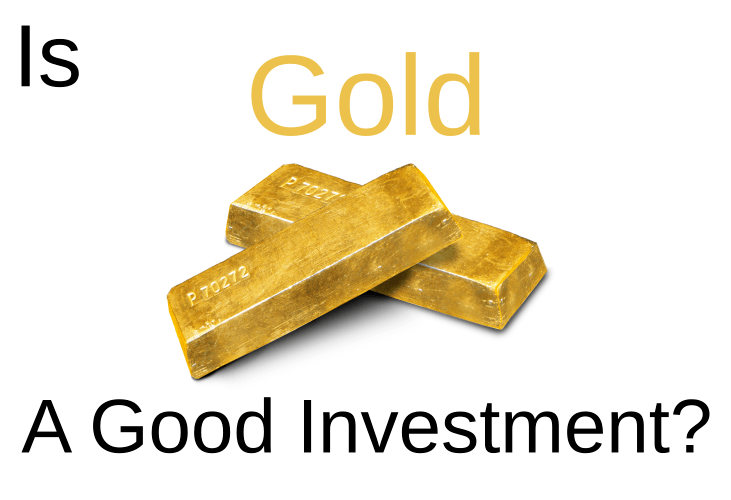 Gold is not an asset that protects your portfolio from the risk of inflation. 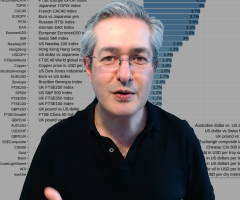 Is gold a good diversifier for equity? To reduce the risk of holding equity in a portfolio we would buy assets whose prices are not driven by the same factors as shares. US Treasuries are an example of an asset that tends to diversify equity risk. This is because the correlation of equity and Treasuries is low, or even negative at times. However if we plot the correlation of gold versus the S&P 500 this is not the case. 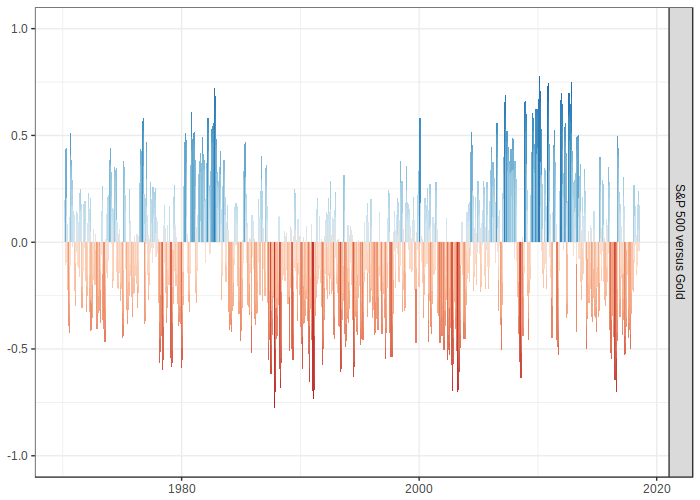 The correlation is very unreliable, continually flipping from positive (blue) to negative (red) and back. This means that at times gold will increase the risk of a portfolio because it is positively correlated with shares. Consequently, gold is unreliable as a diversifier for equities. To show what a good hedge looks like here is the rolling correlation between the S&P 500 and US Ten Year Treasuries (as measured by the iShares IEF exchange traded fund). While the correlation is not always negative it is negative almost all of the time. This is what we want in an equity hedge. 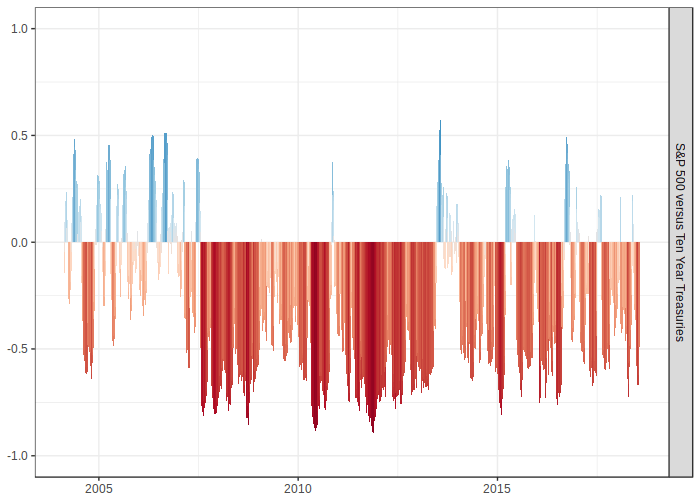 Looking at correlations in daily price movements doesn't necessarily tell us about what happens during an equity market crash. 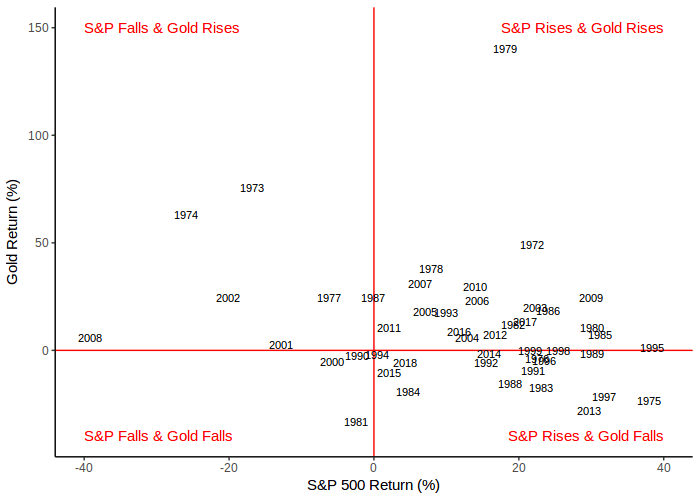 To illustrate this we plot the annual returns of gold and the S&P 500 with the label giving the year for each pair of returns. An ideal crash hedge would have these properties. The hedge wouldn't crash itself! Gold ticks the first box because in the top-left quadrant the crash years for equities (2008, 1974, 2002, 1973, 2001) were years when gold was either flat (2008, 2001) or rallied strongly (1974, 1973). During the good years for equity, however, gold wasn't such a great performer. 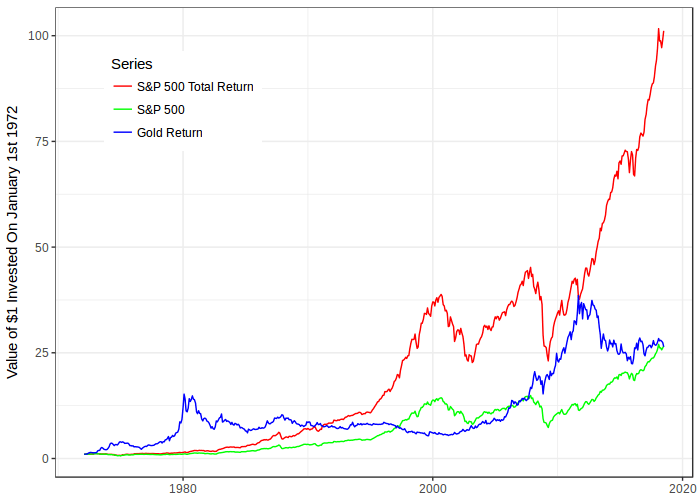 For example in 2013, 1975, and 1997 gold was a drag on equity returns. A big problem with gold is that it is quite risky itself. Gold crashed by -34% in 1981, -28% in 2013, -24% in 1975, -21% in 1997... The fact that gold crashes shows that it is not a good equity "hedge". For comparison here is how US ten-year Treasury bonds performed as a hedge. Only in 1969 did Treasuries fail as a hedge, otherwise they rallied when equity fell. In 2008 Treasuries rose by almost 20%. 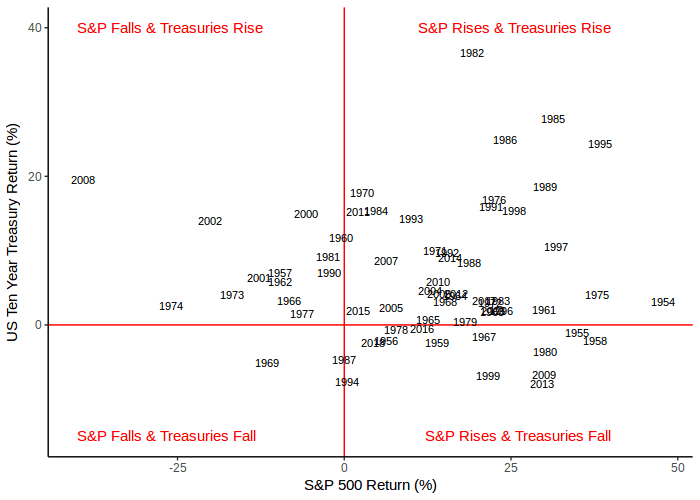 In boom years Treasuries were seldom much of a drag on returns, losing at most 8% (in 2013). Critically a "crash" for Treasuries was at most 8% so it doesn't add much crash risk to a portfolio. Over 50 years from 1970 to 2018 the US dollar has been strengthening versus the pound which has increased the value of gold for UK investors. This is illustrated by tracking the value of £1 or $1 worth of gold in 1970. 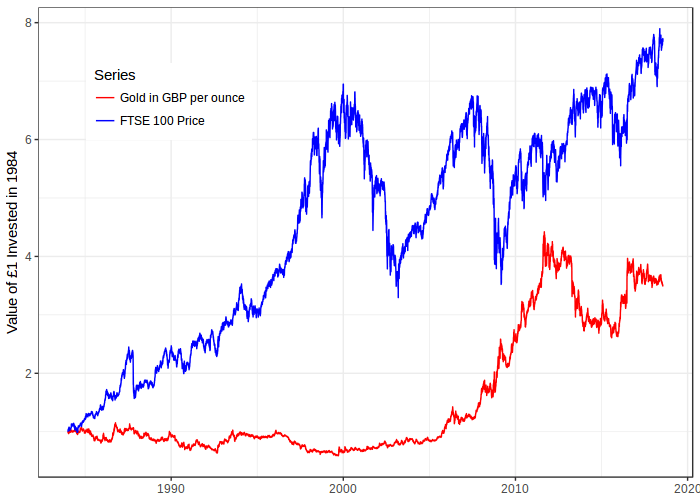 Despite this currency boost for gold it lags the FTSE 100 since data begins in 1984. The outperformance would be even greater if FTSE 100 dividends were taken into account, but as these were not available we simply compare the capital appreciation of the FTSE 100. Given that the US is raising interest rates and the dollar is strengthening as a result both these regimes have historically been ones in which gold performs poorly. Added to these concerns is the fact gold has no fundamental value against which it can be compared. Consequently the price of gold is driven largely by speculation. We would conclude that gold is for adornment, not investment.